Sometimes you plan an Escape to Blue Ridge six months ahead of time and just dream of what it will feel like when you unlock that cabin door and walk in for the first time. You’ve been day dreaming (and maybe even night dreaming!) about exploring the beautiful town of Blue Ridge. Shopping, eating, hiking and enjoying all the quaintness that makes up this town. Back at the cabin you can’t wait to cozy up on the couches, light a fire-indoors or out, and of course relax in the hot tub before turning in for the evening in comfortable bedrooms. With over two hundred cabins to choose from you can be particular about which one you select based on your taste and style. You can select pet friendly cabins or by the quantity of bedrooms. You can pick cabins with game rooms or with gourmet kitchens. You can book cabins with glorious views or that are privately situated. You can reserve cabins by the lake or by rivers. 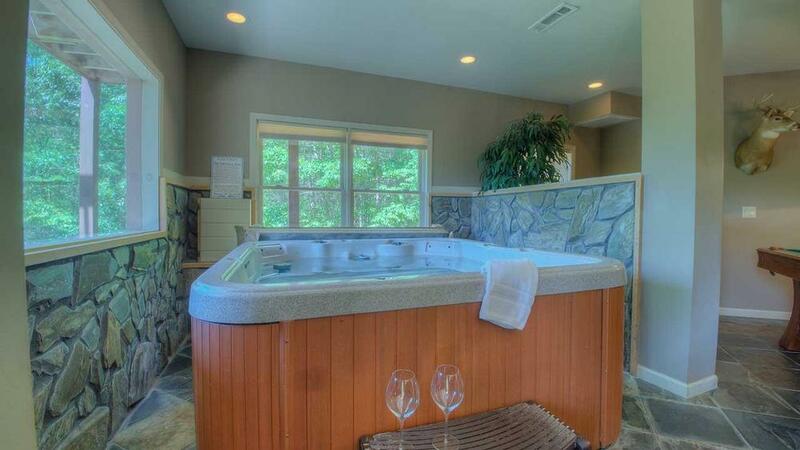 You can even base your decision on the style of hot tub you will get to enjoy! 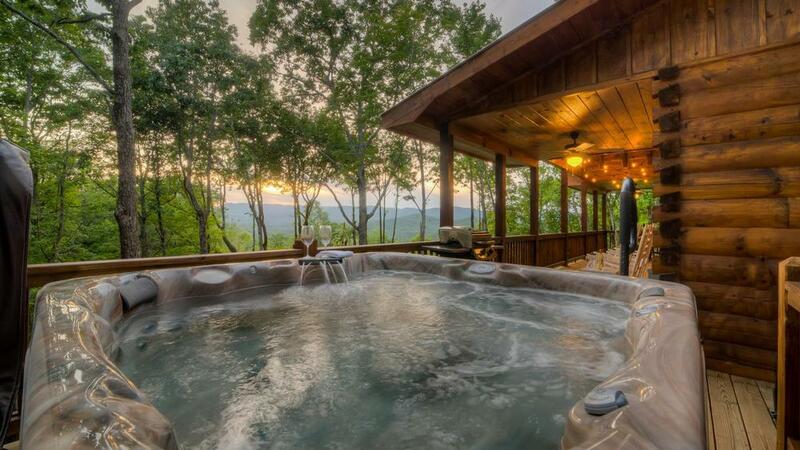 We’ve created a roundup of twenty cabins with nine different hot tub styles! Good things come in small packages, and that applies to the 2-bedroom, 2 bath North Georgia mountain cabin rental A Sunset Dream. Comfortably accommodating a small family, two couples, or four friends on a guys’ or girls’ getaway, it’s a jewel of a home with a spectacular view. 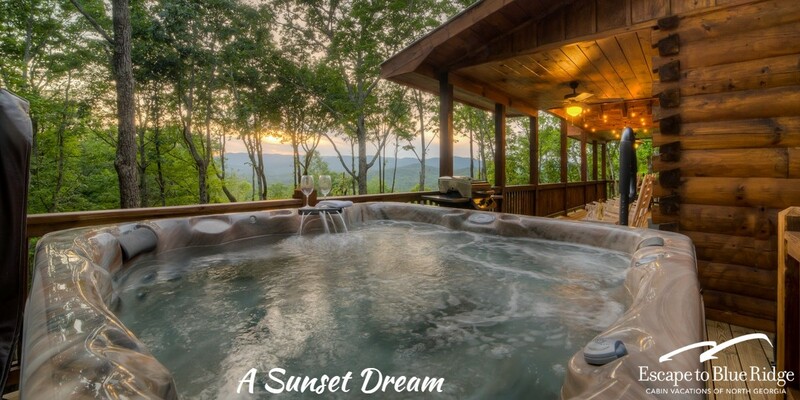 Located in Cherry Log in the Hidden Lake subdivision, just seven miles from downtown Blue Ridge, A Sunset Dream is a secluded, private paradise, aptly named for the glorious sunsets you can enjoy from every room. 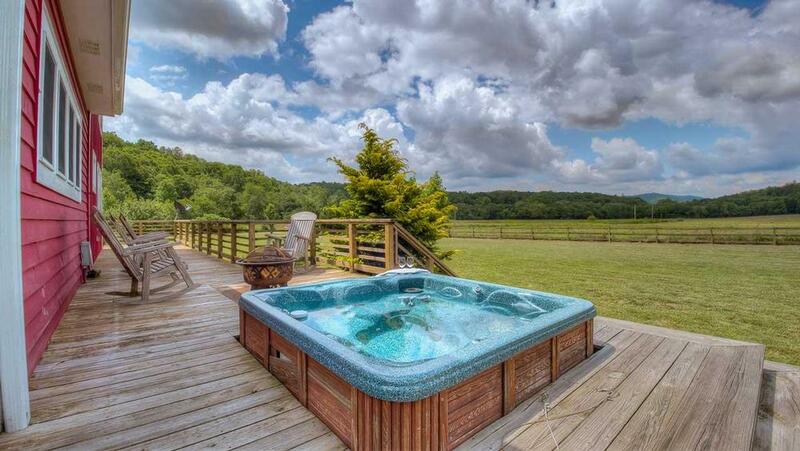 This 4-bedroom, 3 bath home is pet friendly and only ten minutes from the quaint town of Blue Ridge and is perched perfectly within a comfortable and paved cabin community located at the top of Trammell Mountain. This executive-level cabin has a completely open floor plan and offers amazing floor-to-ceiling glass windows overlooking the expansive mountain range. Bearly Behaving is a wonderful, all-around cabin for all kinds of great vacation behavior —it’s cozy enough for a romantic getaway and large enough for multiple families to enjoy. Its panoramas are all-inclusive with short and long-range mountain views and idyllic pastoral scenes. 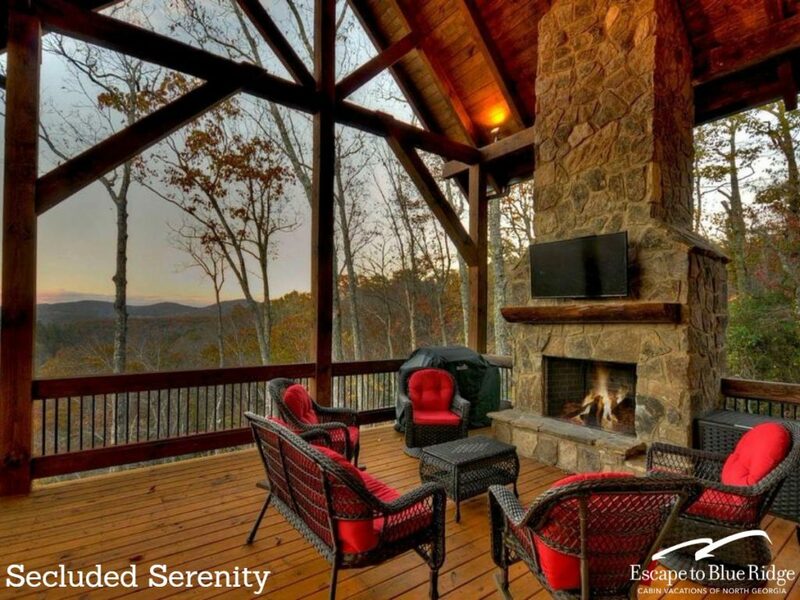 Bent Tree is a 3-bedroom, 3 bath cabin situated at one of the highest points of the gated Greenridge Mountain community in the Aska Adventure Area, overlooking Lake Blue Ridge and miles of rolling mountains for a truly awe-inspiring showcase of views. This is a professionally decorated cabin where the owner has thought of all of the amenities, whether your vacation is for a romantic getaway for two or for the whole family. Although Bent Tree is only 5 minutes from the Lake and the charming town of Blue Ridge, it is the perfect hideaway for an unforgettable vacation. Ascend high into the mountains and climb up the front stairs of Stairway to Heaven where your vacation will reach a whole new level. This perfectly-appointed two-bedroom cottage is a truly romantic getaway with custom touches throughout. The home’s private ambiance belies its treasured location in My Mountain community and its easy 15-minute proximity to downtown Blue Ridge. Stairway to Heaven’s dramatic wall of glass will draw you out toward the amazing covered deck overlooking spectacular mountain and pastoral views. You’ll feel torn about where to spend your time — out on the deck relaxing at the dining table and eating al fresco or back inside where the home’s unbelievable touches draw you in for restful luxuriating. Above and Beyond is a 4-bedroom 3.5 bath that is so named because its magnificent setting, spectacular panoramic view, sumptuous comfort, rustically elegant furnishings, impressive architectural detail and lighting are sure to make you feel “above and beyond”. Located in the Aska Adventure Area four miles from the restaurants and shops of downtown Blue Ridge and the Toccoa River, and five miles from Lake Blue Ridge where you can enjoy boating, fishing or hiking. Also, close to attractions such as Mercier Orchards, horseback riding and zip lining. At Above & Beyond small dogs are welcome, so forget the kennel and bring your furry best friend with you and have a great vacation. Noontootla Cottage is like stepping into a scene from classic American literature, but updated for this century. Sitting amongst the corn field with its sharp roofline angles, stacked stone chimney and open, front deck, the white farmhouse immediately sparks child-like enthusiasm. It sleeps seven and is perfect for a leisurely, fun-filled family getaway or for a couple of parents treating their kids’ to their first fishing excursion. Let Noontootla Cottage reward you, not just through great fishing, but through an entire experience that will reconnect you and your loved ones for a most memorable mountain vacation. Stepping into Tondelia, you’ll immediately be taken by its views and open, airy feel, with spacious rooms and windows at every turn. You’ll marvel at the careful attention to detail that’s been lavished throughout the cabin, where the game room is every bit as beautiful as the main floor and gorgeous bedrooms. This is the perfect setting for several couples looking for a peaceful escape from the city. With its grace and beauty, Tondelia offers a lovely setting to leave your cares behind and enjoy great times with good friends. The days you spend here will be cherished for years to come. If you’re looking for the perfect place to bring your whole family on your next vacation, look no further than Toccoa Playground, a Blue Ridge, GA cabin rental that promises you and your children a fun-filled getaway. 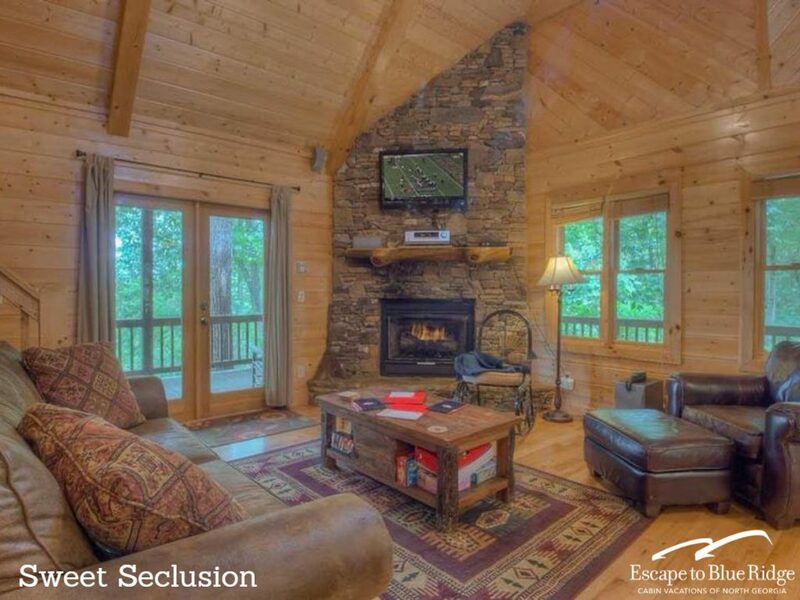 True to its name, this spacious cabin in the woods near the Toccoa River is a playground for both adults and kids, with plenty of child-friendly features and amenities. Large family? No problem: the cabin sleeps ten, and has two sets of twin bunk beds in the downstairs bedroom and twin beds and a toddler bed in the upstairs loft, perfect for your young ones. The loft’s play area includes a puppet theater, play kitchen, a 32” flat screen with Blu-ray, and toys to delight kids of all ages, and the swings, slide, playhouse, and trampoline on the railing-protected deck will provide hours of fun. Older kids (and parents) will love the basketball shooter game outside. A crib, bassinet, baby swing, carrier, portable child seat and high chair are available, and there are safety gates on the stairs. When you think of the perfect Blue Ridge mountain cabin rental, does it have a beautiful wooded mountain setting on a river? Is it private, romantic, and tailor-made for an intimate getaway for two? Riverbend Cottage is that place, a cozy hideaway where you and your loved one can relax, reconnect and rekindle in a picturesque, nature-filled Fightingtown Creek setting. This property also features a separate artist studio right on the water. Located in McCaysville, less than 11 miles from downtown Blue Ridge, but worlds away from the commotion of daily life, this two-level gem of a home is professionally decorated to maximize the spectacular view of the river, just steps away from your door. River Run is aptly named— this stunning home is built right on the banks of the Toccoa River near the famed Shallowford Bridge in Blue Ridge. The views from this unique property are as close to the water as you can get, and the home is tucked into the corner of a lovely wooded lot. Here, life is about both the liveliness and calmness of the abundant river. You can cast your line to fish directly from the home’s huge deck, without moving from your comfortable rocking chair. Or, grab your inner tube to join the happy passersby on floating rides toward river’s end. The home’s level lot offers many vantage points to take in the plentiful views and activity whether from picnic tables, the charming outdoor swing, the huge hot tub or from around an outdoor horseshoe pit. Set on a hillside on more than two acres with breathtaking unobstructed long-range views of the mountains and Lake Blue Ridge, the Adventure Us has its very own waterfall and lots of areas to explore. A spacious tri-level showplace, this 3-bedroom, 3 bath is a private mountain oasis where you can gather with loved ones in a magnificent natural setting that’s close to fabulous and fun activities and experiences. You can take your pet for a walk (yes, your dogs are welcome!) along the fenced-in property for a small taste of the wondrous nature that surrounds you. It’s a short scenic drive to destinations like Amicalola Falls, the Toccoa Swinging Bridge, wineries of Dahlonega and the shops and restaurants of downtown Blue Ridge are only a 10-minute drive down the mountain. Nestled in the trees on quiet Pisgah Mountain at an altitude of almost 2,700 feet just 20 minutes from the shops and restaurants of downtown Blue Ridge and close to fun activities like horseback riding, white water rafting, zip lining, and the area’s wineries and orchards, Appalachian Sunrise is a tri-level showplace with awe-inspiring views that will take your breath away. This pet friendly 3-bedroom, 3-bath can be your home away from home in a wooded oasis with a fabulous view! 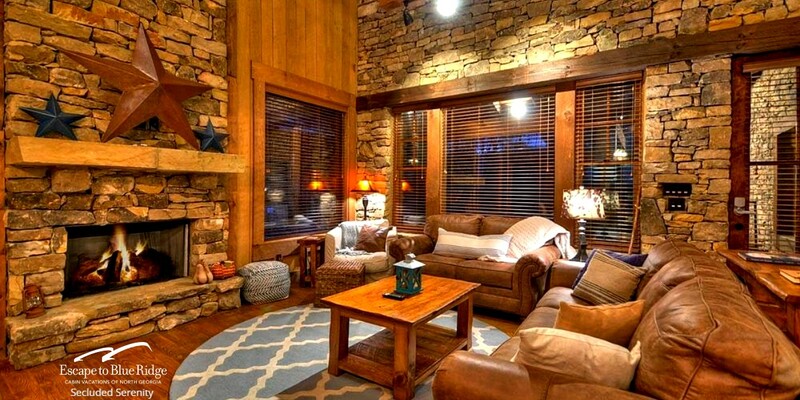 Rocky Top is a cozy Georgia Mountain cabin rental nestled into the My Mountain area of Morganton. You’ll feel like you’re on top of the world here, and truly away from it all. Great for a couple or family, this lovely two-bedroom, authentic log cabin has caramel-colored real log with chinking inside and out, and open beam ceilings throughout the space. Every room has a chic country touch, from the main room’s elegant furniture to the romantic French toile master bedroom, down to the hutch near the dining area displaying a toile-themed plate collection. Spend quiet evenings out on the screened-in porch, lounging on the swing or rockers with a nightcap. Watch a movie on the 50″ flat screen TV in the great room, kept warm and cozy by the corner gas fireplace. Enjoy a romantic, late night dip in the hot tub under starry skies. Rocky Top is a peaceful place high above the hills that feels far away from the rest of the world. With its beautiful mix of mountain cabin and French countryside decor, its unique and charming atmosphere offers a wonderful environment to relax and restore you. The Overlook cabin is a place in a storybook setting where stories are also in fact, created. By far, this property is in one of the most private settings in the North Georgia Mountains. You’ll travel along a sharply winding, steep gravel road that will rekindle imaginings from childhood fables which took place in secret woods. However, this road is easily mastered and your reward rests in the charm and beauty of The Overlook cabin. Perched high above the Aska Adventure area, this home has panoramic mountain and distant lake views. God’s Glory sits atop the coziest nook in the North Georgia Mountains in a lovely and inviting Blue Ridge community. This is a family-oriented cabin in a perfectly private setting with rambling views, yet is also in easy range of town and other neighbors. Reaching God’s Glory is a comfortable drive along paved roads. Perfect vacation daydreams will form as your stress unwinds along the winding idyllic scenery. Beautiful long-range views invigorates the senses and several ponds that peek through the woods call for skipping rocks or cooling wades to soothe on summer days. Welcome to the greatness of a cabin named God’s Glory. The charm of this home and the experiences it provides will bring your family closer and create many memories. Stone Pine Lodge is not your typical Blue Ridge mountain cabin rental. As you’d expect, this brand-new vacation home has the rustic cabin feel, secluded private setting and breathtaking view of the mountains from its tri-level decks. There are enormous windows in its great room that let you take in nature in all its expansive glory. The cabin is also the epitome of effortless modern luxury, putting everything–state-of-the-art at your fingertips. With sound system TVs, lighting, remote gas fireplaces and hot tub with Bluetooth-enabled speakers throughout all with simplistic operations, the better to relax and enjoy the comforts of your home away from home. Named for its four Tennessee Stone fireplaces and pines that surround it, Stone Pine Lodge is perched on a mountainside 22 feet off the ground from its lower deck, where you can hear the faint sound of a small creek below the property. 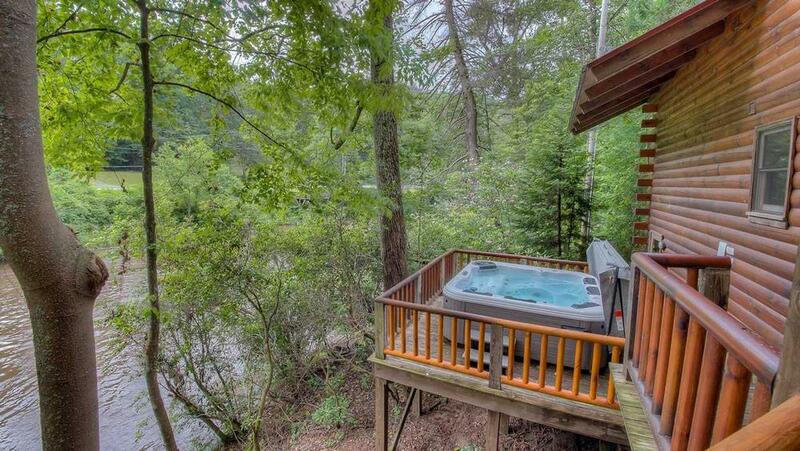 For your North Georgia cabin rental, do you want a beautiful mountain hideaway surrounded by trees or a peaceful water view? If you choose Lake Blue Ridge Overlook, you get both! As its name suggests, this unique cabin is situated on Lake Blue Ridge, which makes it perfect for water sports enthusiasts. It comes with a private dock and boat slip, so you can swim, water ski, and go fishing, boating, kayaking or canoeing to your heart’s content, all just a few steps away. Hiking trails are close by, and it’s only a 20-minute drive to the shops, bars, and restaurants of downtown Blue Ridge. Pure Pleasure on the Lake is a pure delight! 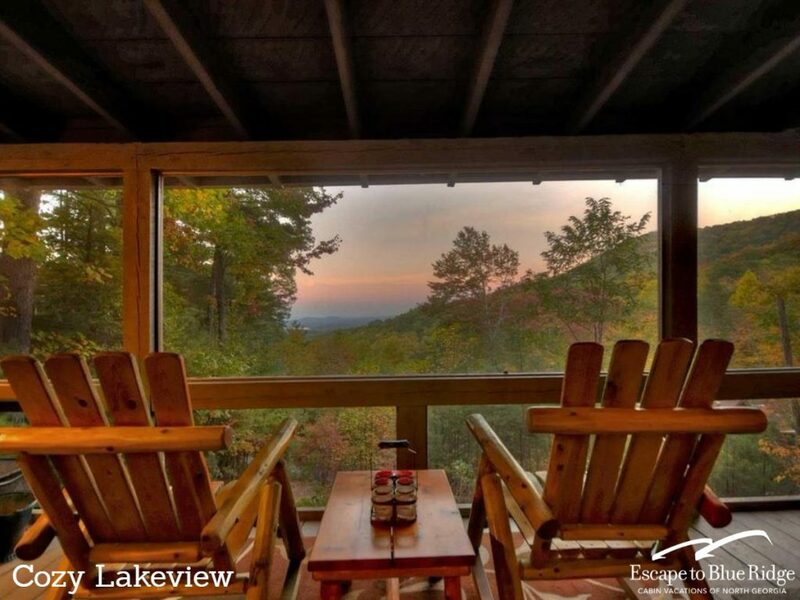 This magnificent North Georgia cabin rental is located on the 20-mile-long Lake Nottely, and has one of the best lake views the area has to offer. It sits just over the shoreline with tiered steps down to its private dock with a ladder. Year-long deep water makes it a great property if you’d like to bring your own boat or rent one from the nearby marina. The cabin is equal distance to iconic Blue Ridge, GA and the new Harrah’s casino in Murphy, NC. This home has been thoughtfully designed all for its guests’ pleasure. Come to Pure Pleasure on the Lake and you’ll find that it fulfills all of your family’s vacation needs from endless fun to never-ending tranquility. Blue Mist Heaven is a luxurious mountaintop cabin with spectacular 180o views that can be yours for a very special vacation getaway. Ideal for large families or a group of friends, this spacious cabin sleeps 12 in its four bedrooms and library/loft, with king beds in the upstairs master, main floor and downstairs bedrooms, twin bunk beds and twin over double size beds in the second downstairs bedroom that kids will love. There’s also a full-size crib and Pack ‘n Play in the closet. But its most important feature is the way it will make you feel: comfortable, relaxed and at peace, like you’ve left your cares behind and entered a luxurious private world, a heavenly experience you’ll treasure for years to come. 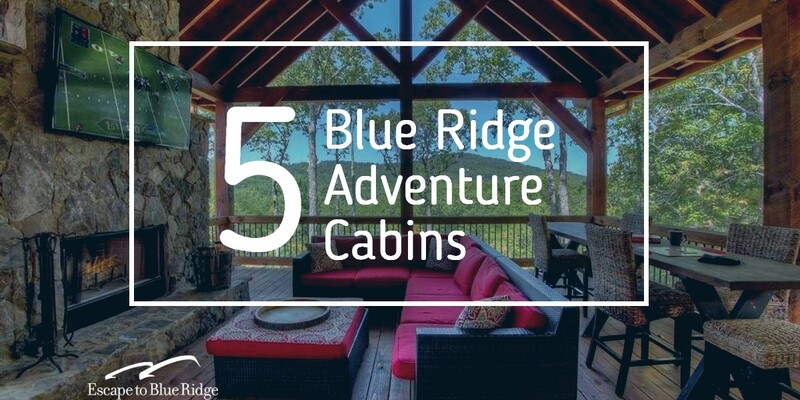 Searching for the perfect Blue Ridge cabin rental to lift you away from the chaos of your daily life? At Rise Up your spirits will soar from the moment you arrive. 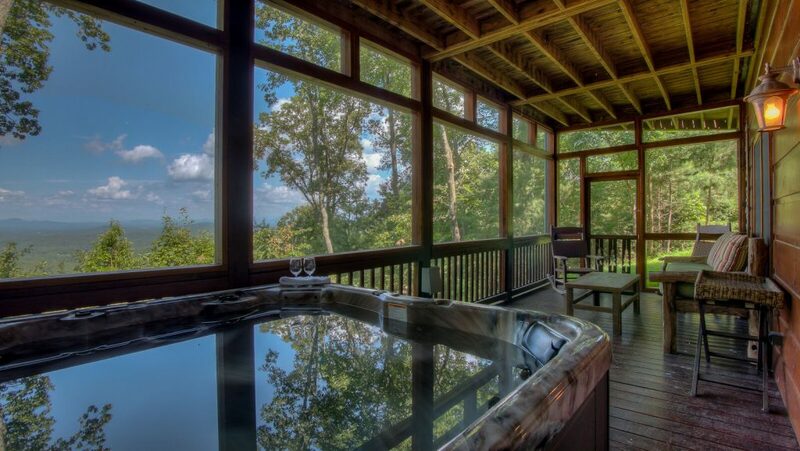 Perched on a hilltop and surrounded by woods, you can take in the incredible long-range views of the Appalachian Mountains from every room. Located in the Aska Adventure area, a short drive from hiking trails, seven miles from downtown Blue Ridge, and only two miles from Toccoa Riverside Restaurant, this cabin offers upscale comfort with a vintage western log cabin theme so that you can unwind and enjoy the peaceful feeling of being nestled in the mountains. We have some of the coolest guests that adventure up into the Blue Ridge Mountains for some good quality R&R. Earlier this fall, a beautiful family from the Southwest region of Florida knew they wanted to come up the mountains and experience the spectacular fall season. Fortunately for them, the 2018 season proved to be one of the most colorful seasons we’ve enjoyed in a while! Fortunately for us, they made this awesome vlog about their journey. The Patriarch, Andres Colin, is a talented singer-songwriter in and around the Sarasota area. His lovely wife, Kristen, is an equally talented photographer. Together they have one beautiful little girl, Aria, and another bundle of joy on the way. So, needless to say, life is pretty busy for the Colin family, but that wasn’t going to stop them from getting away. A local Sarasota artist, Jay Tyler of Steel View Art, recommend the family Escape to Blue Ridge and stay in a cabin called Woolly Bugger. Have you driven eight hours with a toddler before? Well, lets just say the eight hour drive from Sarasota took more like twelve hours, but their reward was coming! Alas, they arrived in the mountains along a quiet dirt road and stepped out of the car to experience the crisp mountain air and check out their home away from home. 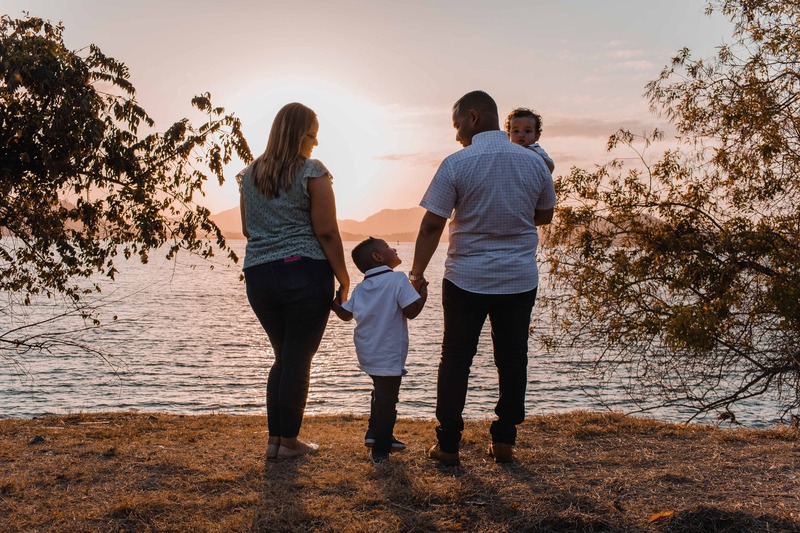 You will delight when you watch the family explore the lakes and mountains of the Appalachian region, your heart will melt when you hear Andres sing Happy Birthday to Kristen, and you will thoroughly enjoy Andres singing Una Guitarra by Gerardo Pena. With any good road trip, food is a critical factor. Luckily for the Colin Family, there are no shortage of good restaurants in the Blue Ridge area. You may think a little mountain town only survives on bbq, cornbread, biscuits, and sweet tea. While that is absolutely 100% true, but we also have a taste for the finer things in life including healthy options offering gluten free and vegan selections. With memory cards filled with pictures and hearts full of family memories, the Colin Family has to begin their journey back to their regular lives. One last stop in Georgia finds the family in Valdosta at the most delightful downtown market and café, Birdie’s. That’s when the Colin’s knew. They’ve been bitten by the Travel Bug and they will make a point to get out and travel more. There is just too much in life to experience. Take about six minutes and enjoy this very well done and beautiful vlog by Andres Colin and his family’s Escape to Blue Ridge!